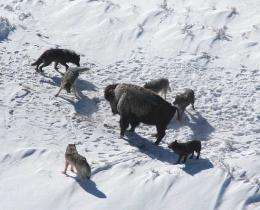 Mollies Pack Wolves Baiting a Bison. Image: Wikipedia. Washington State University researchers have found that it is counter-productive to kill wolves to keep them from preying on livestock. Shooting and trapping lead to more dead sheep and cattle the following year, not fewer. Writing in the journal PLOS ONE, WSU wildlife biologist Rob Wielgus and data analyst Kaylie Peebles say that, for each wolf killed, the odds of more livestock depredations increase significantly. The trend continues until 25 percent of the wolves in an area are killed. Ranchers and wildlife managers then see a "standing wave of livestock depredations," said Wielgus. Moreover, he and Peebles write, that rate of wolf mortality "is unsustainable and cannot be carried out indefinitely if federal relisting of wolves is to be avoided." The gray wolf was federally listed as endangered in 1974. During much of its recovery in the northern Rocky Mountains, government predator control efforts have been used to keep wolves from attacking sheep and livestock. With wolves delisted in 2012, sport hunting has also been used. But until now, the effectiveness of lethal control has been what Wielgus and Peebles call a "widely accepted, but untested, hypothesis." Their study is the largest of its kind, analyzing 25 years of lethal control data from U.S. Fish and Wildlife Services Interagency Annual Wolf Reports in Montana, Wyoming and Idaho. They found that killing one wolf increases the odds of depredations 4 percent for sheep and 5 to 6 percent for cattle the following year. If 20 wolves are killed, livestock deaths double. "I had no idea what the results were going to be, positive or negative," he said. "I said, 'Let's take a look at it and see what happened.' I was surprised that there was a big effect." Wielgus said the wolf killings likely disrupt the social cohesion of the pack. While an intact breeding pair will keep young offspring from mating, disruption can set sexually mature wolves free to breed, leading to an increase in breeding pairs. As they have pups, they become bound to one place and can't hunt deer and elk as freely. Occasionally, they turn to livestock. Under Washington state's wolf management plan, wolves will be a protected species until there are 15 breeding pairs for three years. Depredations and lethal controls, legal and otherwise, are one of the biggest hurdles to that happening. Wolves from the Huckleberry Pack killed more than 30 sheep in Stevens County, Wash., this summer, prompting state wildlife officials to authorize killing up to four wolves. An aerial gunner ended up killing the pack's alpha female. A second alpha female, from the Teanaway pack near Ellensburg, Wash., was illegally shot and killed in October. "We're one-third of the way towards recovery and now we're way off," said Wielgus. "Recovery is going to take x more years because of what happened. Obviously you can't keep doing that." In an ongoing study of non-lethal wolf control, Wielgus's Large Carnivore Lab this summer monitored 300 radio-tagged sheep and cattle in Eastern Washington wolf country. None were killed by wolves. Still, there will be some depredations, he said. He encourages more non-lethal interventions like guard dogs, "range riders" on horseback, flags, spotlights and "risk maps" that discourage grazing animals in hard-to-protect, wolf-rich areas. "The only way you're going to completely eliminate livestock depredations is to get rid of all the wolves," Wielgus said, "and society has told us that that's not going to happen." What caused the delayed 'depredation' deaths of the livestock, and how is it causally related to the reduction of wolf populations? Bad data can be just as misleading as no data.